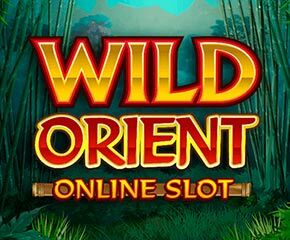 Wild Orient is a new video slot game which is powered by Microgaming. The slot is dual-themed and is based on subjects of Far East and animals. The slots game features lots of wild creatures and when they occupy their spaces on the reels, they offer some hefty amounts. A massive bonanza amount as big as 160 times of the player’s stake can be won in this slot game. Enjoy Playing In Wild Orient! 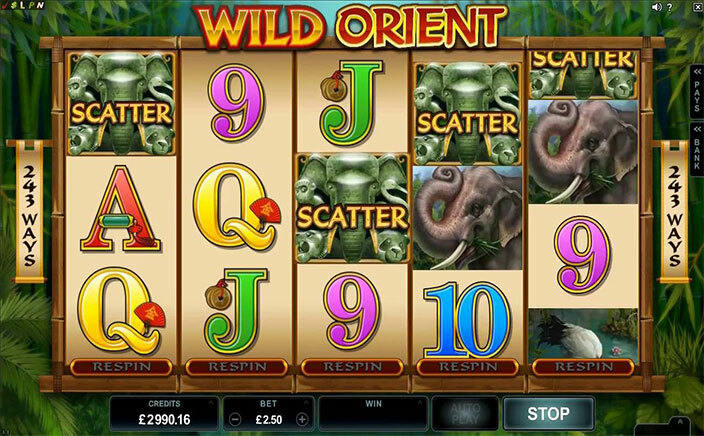 Wild Orient is a 5-reel slot and has 243 fixed paylines. The standard paylines structure are replaced by a system where winning combinations are formed as long there are the matching symbols on the adjacent reel starting from the left-hand side. The reels of the slot spin in the bamboo-made frame in front of a steamy forest and the minimum and maximum bet lie between £0.25 a spin to £125.00 a spin respectively. The high-value symbols of the slot are represented by a tiger, an elephant, a panda, a wading bird, a monkey, while the low-paying ones are the standard playing cards 9, 10, J, Q, K, and A. The wild symbol is the Wild Orient logo and it appears only on the reels 2 and 4 and will replace all the other symbols except scatter symbol which is a stone carving of animals. The Free Spins – This feature is activated by landing 3 or more stone carving scatters anywhere in sight and for this, you will get 15 oriental free-spins with all the wins subject to a 3x multiplier. Spins can be reactivated by landing three more of scatters anywhere in sight. Reel Respin Feature – It is a very interesting feature and after every spin (not in case of autoplay) one will an have opportunity of respinning any of single reel in the hope of landing a symbol that will form a winning combination. The cost of the spin depends on a particular win you will land. Wild Orient slots is known mainly for its reel respin feature which adds a real creative touch to the game. It has nice graphics and a typical Chinese music that is quite enjoyable. The RTP of 95.02% is expected from this slot.